The Bay of Bengal for the first time ever in this year is getting all warmed up for an event that could be a cause of worry for the residents of eastern India, and maybe for Bangladesh. A tropical cyclone could form in the central Bay of Bengal during the last week of October while it’s formation has already started. Apart from this storm, on October 10, a depression BOB 01 formed in the Bay of Bengal that brought flooding rain with high winds to Bangladesh. The tropical activity of 2012 in the north Indian Ocean has been the lowest since many years. 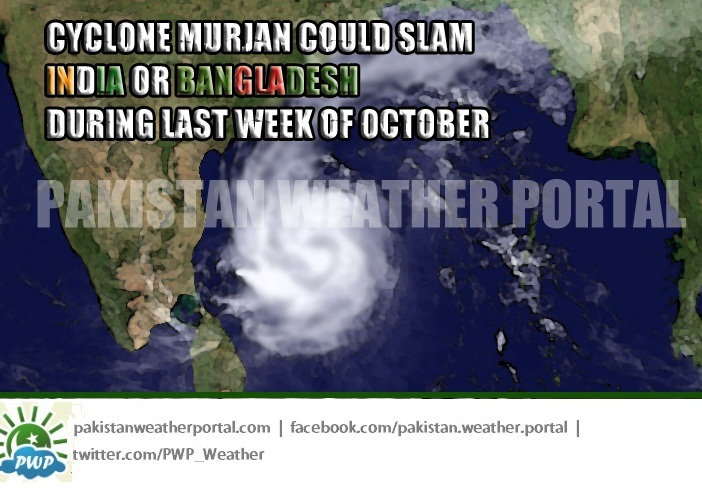 ‘Murjan’ could bring 65 km/h winds! North-West: West Bengal and adjoining Bangladesh. West-South-West: Towards upper Srilanka and adjoining Tamil Nadu. West: Towards Andra Pradesh and adjoining Orissa. It is not clear at which direction this weather system would head but after landfall it will surely move in a North-eastern direction. Landfall is expected on October 30/October 31 depending upon the track, it could change though. Murjan – It is an Arab word given by Oman which means Corel. Something also happening in other ‘sea’? Meanwhile south-east Arabian sea has given brith to a low pressure that might intensify further into a well-marked low pressure area that would move towards horn of Africa as a remnant. ← October storminess: Cyclone Onil came with full force! AN AREA OF CONVECTION HAS PERSISTED NEAR 10.2N 68.3E, APPROXIMATELY 1030 NM EAST OF CAPE GUARDAFUI, SOMALIA. ANIMATED MULTISPECTRAL SATELLITE IMAGERY AND A 220144Z WINDSAT 37GHZ IMAGE DEPICT A VERY BROAD LOW LEVEL CIRCULATION CENTER (LLCC) WITH FRAGMENTED, CURVED DEEP CONVECTIVE BANDING WRAPPING INTO A POORLY DEFINED CENTER. A 211902Z OCEANSAT IMAGE SHOWS A WELL-DEFINED CIRCULATION WITH 15 TO 20 KNOT WINDS. THE LLCC IS LOCATED SOUTH OF THE SUBTROPICAL RIDGE AXIS AND IS UNDER DIFFLUENT EASTERLY FLOW WITH WEAK TO MODERATE (15-20 KNOTS) VERTICAL WIND SHEAR. THE DYNAMIC MODELS FORECAST SLOW DEVELOPMENT AS THE SYSTEM TRACKS WESTWARD. MAXIMUM SUSTAINED SURFACE WINDS ARE ESTIMATED AT 20 TO 25 KNOTS. MINIMUM SEA LEVEL PRESSURE IS ESTIMATED TO BE NEAR 1004 MB. BASED ON THE BROAD LLCC AND LACK OF CONSOLIDATION EVIDENT IN RECENT TOTAL PRECIPITABLE WATER IMAGERY, THE POTENTIAL FOR THE DEVELOPMENT OF A SIGNIFICANT TROPICAL CYCLONE WITHIN THE NEXT 24 HOURS IS LOW. Arabian sea system does not look significant, but Bay’s system would be something to watch. 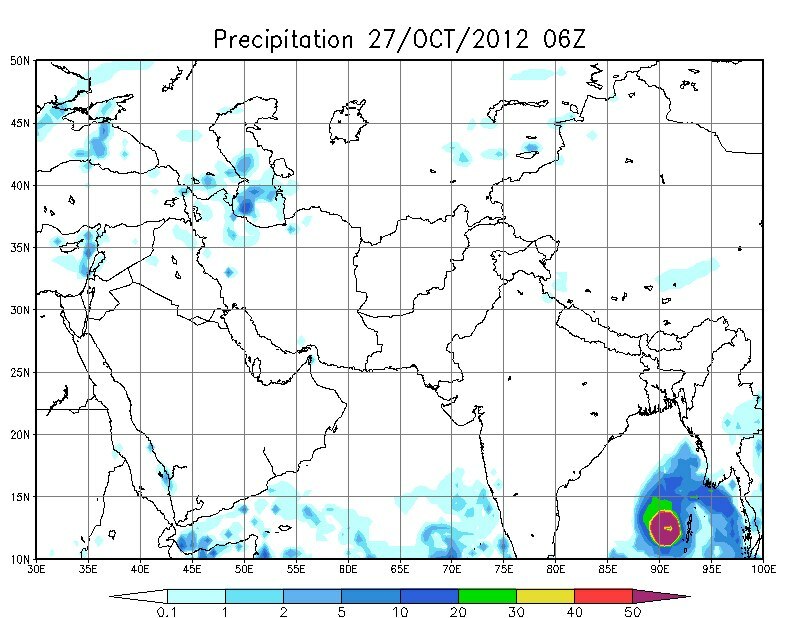 But dont be surprised if the Arabian Sea low (95B) becomes a named cyclone. It may go for a deep depression.. Seems to me that somalia is the target…..
Latest satellite imagery indicates that a depression has formed over southeast and adjoining southwest and central Arabian Sea and lay centred at 0830 hrs IST of today, the 23rd October, 2012 near latitude 11.00N and longitude 65.0.0E, about 800 km west of Amini Divi (Lakshadweep). The system is likely to intensify further and move west-northwestwards towards Somalia and Yemen coast during next 72 hrs. ACCORDING TO SATELLITE IMAGERIES, THE INTENSITY OF THE SYSTEM IS T 2.0. THE LOWEST CLOUD TOP TEMPERATURE (CTT) IS ABOUT -790C. ASSOCIATED BROKEN INTENSE TO VERY INTENSE CONVECTION IS SEEN OVER THE ARABIAN SEA BETWEEN LAT 6.5ºN to 16.5ºN long 54.5ºE to 64.0ºE. CONVECTION IS MORE INTENSE IN THE SOUTHWEST SECTOR OF THE DEPRESSION. SUSTAINED MAXIMUM SURFACE WIND SPEED IS ESTIMATED TO BE ABOUT 30 KNOTS AROUND SYSTEM CENTRE. THE STATE OF THE SEA IS ROUGH TO VERY ROUGH AROUND THE SYSTEM CENTRE. THE ESTIMATED CENTRAL PRESSURE IS ABOUT 1002 HPA. Hey Pradeep – I am also thinking about it but I believe it would not intensify into a cyclonic storm, if it does then I would put an alert. I am more focused on Bay’s system as it could move towards populated areas.